At the cellular level, all cells emit sound frequencies as a consequence of their metabolic processes. 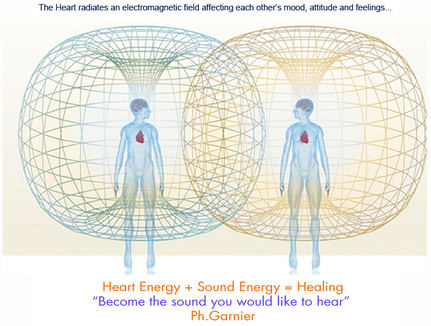 Further, there is an interaction between the cell’s own sounds and those imposed by the environment, including sound healing devices. 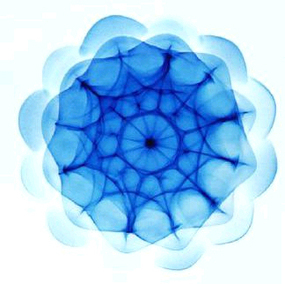 The resonance principle implies cellular absorption of the healing sounds that are introduced and/or their harmonics. In sound healing, resonance principles are engaged to re-harmonize cells that have been imprinted with disruptive frequencies. Such troublesome imprints may have been a result of toxic substances, emotional traumas, pathogens, or long-term exposure to noise pollution.
" The vibrational frequency in which we operate will attract a similar vibration to us. Like attracts like. The experiences of our lives are a direct result of our vibrational state, our thought patterns and feelings are sending around us frequencies that will attract what we are already processing." Matter is made of a molecular structure and space, as it was told by our scientists (and ancient Sages from the Vedic and Buddhist traditions), no object is really solid, rather it vibrates at different speeds and makes the object appear solid. Objects are made of atoms and quarks vibrating at different speed giving the impression of solidity. Our world is a world of exchange of vibrational energies, sound. In Quantum science it is say that our observation affects the object being observed, it interacts with our desires. Observation affects reality. In a controlled experiment, researchers demonstrated how a beam of electrons are affected by the act of being observed. Our influence on our reality is limitless. Particles can also behave as waves, sound. 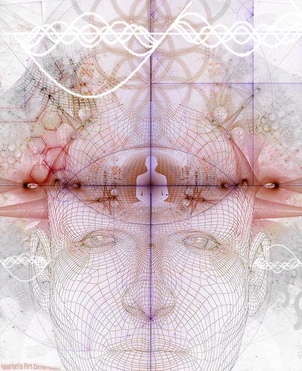 Our vibrational signature is the electromagnetic field of who we are, body, mind and spirit. This vibrational energy that is us will attract energy similar to our own. When we are tapping a tuning fork in proximity to another one of the same tone, both will vibrate, it has been called the law of resonance. Our experiences correlates with the frequency we emanate. So in this understanding, a happy person will attract happy people around resonating at a similar frequency, a person with negative thoughts will be more inclined to surround her/his self with a negative person, and so on. In raising our consciousness and vibration (awareness of our thoughts) our perceptions of the world will change and we will transmute with it. Sound Healing is a tool to transform our field and resonate to higher frequency, using the law of resonance, and by matching our vibrational signature to the fundamental tone of the universe, the creative power of all that grows, and all that breathes. Our brain pulses and vibrates like everything in this Universe. The brain pulse is measured like sound in cycles per second or Hertz. Sound healing can bypass our thoughts clutter, and the monkey jumping from branch to branch will quiet down. A still point can be created and the brain waves can be entrained to a theta or delta "state of mind". At this point the merging of energies is facilitated and the field can be harmonized to All That Is, restored with balance and wellbeing. In this range of brain waves, one can merge with the mass consciousness of our planet and beyond, thus making a link to the Source and tapping into the limitless power of who we really are, Multidimensional being. All audible sound takes birth from the ocean of the unheard composition that is life (our reality). It is taking place within and without ourselves, and we are the entire part of this symphony, being the micro cosmos mirroring the universe, and the universe reflecting us in return. "We live in extraordinary times, where the veils of illusion are dropping down around our feet, letting our mind, and more so, our heart "à découvert" to be open, giving us a choice for a new world yet to be created. A new string to be struck, a new chord to be played." We are still living in the mist of (re)discovering a whole new consciousness and "raison d'être" literarily translated as "reason of being". With the awareness of the vast vibrational world around us, our ears will expand to new frequencies. By feeling a wider range of sound, logos, our new resonance will match our new consciousness. Our living Mantra. By this awareness alone, a door is open to healing (from the root word of wholeness). From the center of our heart, a 3rd Ear is now developing, from our daily awareness comes a new dawn in the human history. A recalibration is taking place naturally.